"Gosta" said the toddler, eliciting proud smiles. red rocks. Utah on the ocean. Vibrantly striated cliffs along the Sierra de La Giganta mountains lining the Sea of Cortez. Sea cave at Ensenada de la Ballena. Ensenada de la Ballena (Bahía Berrendo). named Ensenada de la Ballena ("Whale Cove"). is the mirror of tranquility. "Roca Solitaria" evokes the Grand Canyon's "Point Imperial." Mini Market Miguelito with a solar panel out front. No fancy gourmet goods, but the basics are all here. Outdoor refrigerators contain chilled vegetables. 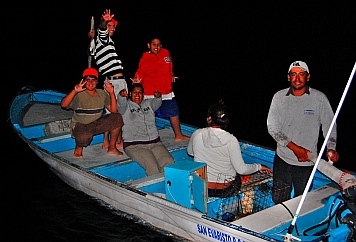 Agua Verde is all about fishing. Agua Verde's old cemetery dates from the mid-1900's. make a meager living out here. México (the Mexican Navy) once again. Path from town to the beach. ourselves "would this be okay in northerly blow?" turned out to be a family, including a baby. lobster?). I explained that we don't really like lobster but we love fish. To my astonishment, the young driver told me they had no fish on the boat but he would be back in an hour with some for us. they don't quite say them right. If only my feeble efforts at Spanish were met with such delight! We decided to move further north and stopped at Puerto Los Gatos. beautiful, smoothly rounded red rocks roll down to the water. than to persuade the bees to leave the boat. is a perfectly round hole giving the point its name "Oarlock Point" or "Punta Gavilán." echoing off the back walls. around the inside of the cave. filled a valley behind the beach and ran up the sides of two mountains. know these things ahead of time. "Loreto Fest" was taking place the gusts got into the 40's. their mooring lines and other boats dragged their anchors. We had no such trouble, but the swell was merciless. and each other as we tried to move about the boat. about a quarter inch. Thwang!!! The rock pinnacle "Roca Solitaria"
was reminded of "Point Imperial"
the rocky mountains rising behind them. outside the door on the front wall. imagination, but the few shelves had a surprising variety of items. simple wire ran from the panels to the charge controller, car battery and inverter. and carefully counted and loaded into coolers in pickup trucks. arrive and run a hose to fill the gas tanks on the fishing boats. we would hear the pangas return. and they all had VHF radios and antennas. The trade is the same, but it is a different era. en route to La Paz from Loreto. adornments lovingly placed there by living family members. side showing a full row of molars. fishermen headed out for the evening's catch. could go out to fish together. was never this way in the past. It's just a sign of the times. Norther, and we were ready for more Baja adventures in the Loreto area. Find San Evaristo, Puerto Los Gatos and Agua Verde on Mexico Maps.